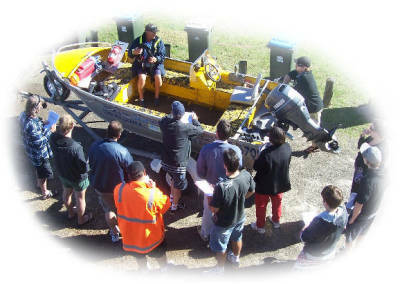 Power Boat Licence Course - Brisbane Boating Courses, Boat licence and Jetski licence training in Brisbane QLD, and AMSA approved Exemption 38 courses at Redcliffe. Neil Bailey is an experienced trainer and will teach you all that is required to pass your Recreational Marine Driver Licence (RMDL) practical and written assessments. During your boat licence course you will be involved in group exercises which include checking vessel safety equipment and checking the vessel is seaworthy, (making sure the bungs are in), better to do this before we head out on the water! Then the fun part. 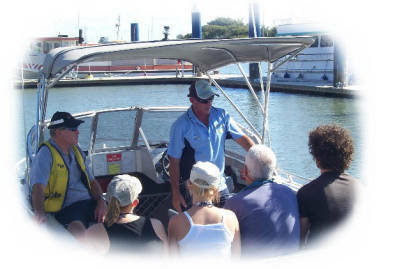 You will be driving the vessel and performing a number of basic tasks that will be explained and demonstrated to you. If you don't get it right the first time, that’s ok, you will be given further opportunities to show your competency. Following successful completion of this Boatsafe course, you can get your licence by taking the statement of competency into a Department of Transport and Main Roads customer service centre within 6 months along with a marine licence application form. we operate 7 days a week at our training room at the Redcliffe Showgrounds, Scarborough Road, Redcliffe QLD, and service the following areas Brisbane north,Sandgate,Strathpine,North Lakes,Enoggera,Ferny Hills,Caboolture, Burpengary,Deception Bay, Ipswich,Toowoomba,Bribie Island,Sunshine Coast and conducting online assessments at Somerset, Atkinson(closed) and Borumba dams. PAY FOR 3 OF THE SAME LICENCES AND RECIEVE A 4TH FOR FREE !!!!!!!! Brisbane Boating Courses provides boat and jetski licencing in Brisbane QLD and surrounding areas including Gold Coast and Sunshine Coast.